This wood frame, made from genuine Pine, is reminiscent of modern furniture. The gray finish with distress marks and random knot holes perfectly complements the simple yet striking profile. This gray frame is wide and distinctive, to enhance everything from modern photography to traditional fine art. Perfect fit for cool art prints I ordered. They look beautiful in my new home office. Not crazy about the distressed look. The frames are well constructed. I am not crazy about the distressed look. Just looks like the wood was hit a few times with a hammer. Hello Karen! Thank you for your feedback. We are glad to hear that you are pleased with the construction of the frame. However, if you are not pleased with the finish of the frame, please give us a call. We have a 45 day return policy, and we are more than happy to exchange or replace items on the order within that timeframe. Please give us a call if you would like to exchange the frame. Our Customer Care team will take care of you at 1-800-332-8884. Thank you for your business! Hello Brad! Thank you for choosing Pictureframes.com for your framing needs. We appreciate you taking the time to leave us a review. 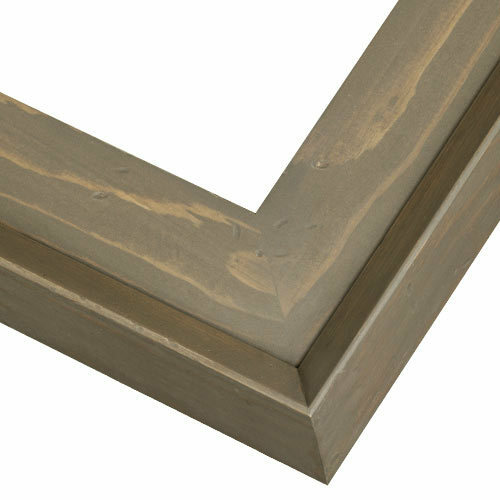 We have a detailed description of the frame describing the natural characteristics of the moulding. We apologize that you were not expecting this Rustic appearance. This Plein Air Pines frame is made of genuine Pine. The frame is designed to have distress marks and random knot holes. We have emailed you a UPS return label than can be used to return the frame. Once the frame is returned we are happy to offer you a full refund. If you have any additional questions, please give us a call at 1-800-332-8884. Have a great day! With my watercolors this frame is natural and not heavy looking. I was looking for an inexpensive, fairly wide, rustic frame that I can tint myself. This definitely fit the bill. Wanted a more rustic look, but no knot holes, for a fox painting that I just finished. I haven't been able to find quality 10 x 10 frames locally. Your site was highly recommended by my art teacher. My choices locally are black or white and cheaply constructed. This is a sturdy handsome frame that looks good and does not detract from my landscape paintings. I like the look. I think it goes well with my seascape themed painting. My artwork is matted to 14x18.I do not see that size included for this frame. Do you not offer that size ? BEST ANSWER: Hello Barbara! Unfortunately this unique frame does not come in size 14"x18'. Please consider a frame from our Plein Air Country Collection. We have attached a few unique color choices from the Plein Air Country Collection below. If you need further assistance, please let us know. Happy Framing! Will this hold a canvas? BEST ANSWER: Hello! Thank you for submitting your inquiry. Yes, this frame will work with a canvas. The depth of your canvas will need to be compatible with the depth of the frame. Please measure the thickness of your canvas from the side to find out the depth. The depth of the 6PLP frame is 1/2" and we recommend that the canvas be at least 1/2" or less. Please be aware that if the canvas is more than 1/2" in depth, then the canvas will protrude from the back of the frame. If you have any questions, please give us a call at 1-800-332-8884. Have a awesome day!